The following code snippet samples from a standard normal distribution using the Box-Muller transform, which avoids nastiness like cropping to a fixed number of standard-deviations or rejection sampling. I have shamelessly cribbed this from Wikipedia (the previous link), but use it all the time, so I'm putting it up as a snippet. I have updated the pyPolyCSG python constructive solid geometry library to use the most recent version of the Carve CSG library. The updates to Carve appear to make it significantly more robust as well as much faster. 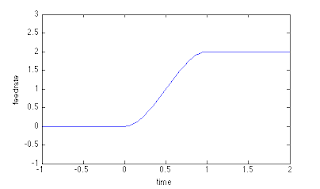 In the previous post, I derived equations for smooth feedrate control of stepper motors, claiming that by using a smoother feedrate envelope that the motors could be driven faster with less chance of skipping steps and losing position. In this post, I demonstrate this with a real stepper motor and show that it actually does work: using the envelopes does actually prevent the motors from losing steps. My test setup is a single NEMA 17 stepper, driven by one of my A4988 driver breakouts, which is controlled by an Arduino sketch running on the Arduino Due. I'm using half-stepping on the motors, driven by a 200KHz timer interrupt step callback which decides whether or not to step based on the interpolated supplied delays for the start and end of each move. The move itself approximates a square wave, first accelerating from a slow feedrate, then performing a constant speed portion, then decelerating back to the initial feedrate. The video below shows the stepper being driven using a constant acceleration profile, which causes the kinks in the feedrate graph in my previous post. You can clearly see it moving around on the table and stalling frequently before it reaches the top speed. In contrast, here is the result using the third-order cubic feedrate envelope for the same set of moves. The stepper is easily able to handle the top speed and jerks around considerably less on the table. Of course this comes at a price, a higher pulse-frequency must be used to resolve the acceleration profile. You can get the code I used for this from following link: https://sites.google.com/site/jamesgregson/tmp/linear_move.zip, it includes a multi-axis DDA implementation suitable for use with timer-interrupts as well as the code for evaluating the feedrate envelopes. When running motors it is desirable to run them as smoothly as possible to minimize vibrations and possible missed steps. This is why controllers for 3D printers and CNC machines typically incorporate some notion of acceleration rather than instantly switching from one feedrate to another. Often this is done with a simple ramp of the feedrate, i.e. using a constant acceleration profile. 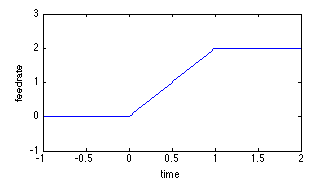 The problem with a constant acceleration profile is that there are sharp kinks in the feedrate plotted over time. These kinks imply instantaneous changes in acceleration, which in turn imply infinite forces for infinitely short periods of time. Of course, there is no mechanical way to produce these forces, so what actually happens is the machine overshoots very slightly and averages the forces out over a short time. For low feedrates with a light machine this actually works okay, but for a heavy machine at high-feedrates, the overshoot can be more than a motor step which causes the machine to lose position. In an open-loop design, once the machine loses position, it never recovers and in all likelihood, the part is ruined. The first is clearly not an option because it wastes time and feedrates may be chosen specifically for valid reasons such as minimizing local part heating or reducing machining time. In an ideal world we'd do the remaining three items, but options two and three are expensive, particularly for hobby gear. However the fourth option can be tackled in firmware with minimal hardware overhead. 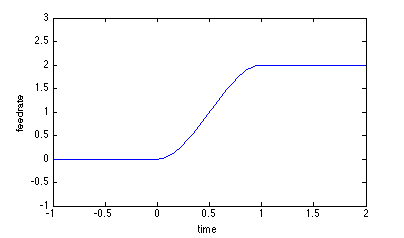 In order to smoothly transition between accelerations we can simply use a different curve to interpolate the feedrates. The conditions needed are that the feedrates match the desired rates at the beginning and end of the curve and that the slope of the feedrate curves (i.e. the acceleration) is zero at the endpoints. In between the endpoints we want the curve to be smooth. In the post-to-come I will demonstrate applying this to a real stepper motor being driven aggressively. Although seemingly complicated, for a cost of only a few operations per step, it is possible to switch from the linear acceleration profile to the cubic one derived here and get considerably smoother operation. An excellent introduction to the method can be found in the paper: Distributed Optimization and Statistical Learning via the Alternating Direction Method of Multipliers by Boyd et al.. It's a pretty gentle and practical introduction, with numerous example problems. I've quickly implemented ADMM for combined deblurring and denoising of 1D input signals using the total-variation regularization in a Generalized-Lasso problem definition. Unlike the Boyd paper, I've chosen to use Landweber iterations to solve the data subproblem as these are commonly used in large-scale deblurring and tomography. My well-commented sample implementation (see the end of this post) allows all the method parameters to be tweaked to see the effect of using inexact solves, different penalty parameters and different regularization weights. 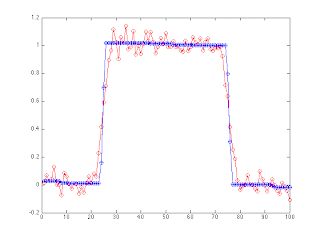 As an example, the image below shows a 100 sample square-wave signal, blurred by a Gaussian with standard deviation of 3 and corrupted by Gaussian noise with a sigma of 5%. Only two inner Landweber iterations were used for each outer iteration. 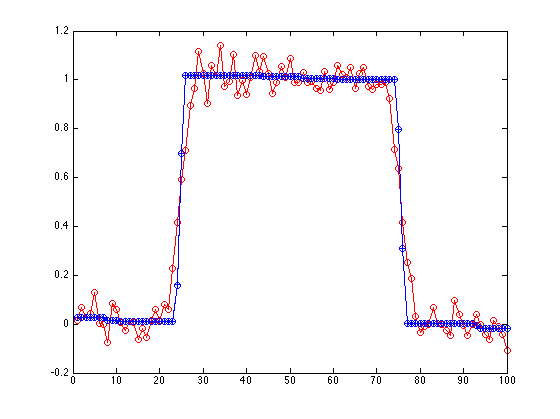 The red line shows the original blurred and noisy input, while the blue line shows the reconstructed result after 100 iterations. Overall I find that the method works as advertised. It's fairly easy to implement, either in Matlab or in C/C++, can handle 1-norms of general linear regularizers and converges quickly. It also allows matrix-free solvers to be used for the data-subproblem, while the solve for the prior is embarrassingly-parallel, so it should scale quite well too. 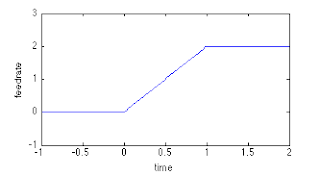 You can get the implementation that produced this plot below. Note that you may get slightly different results since the noise is generated randomly. % iteration should be used instead.